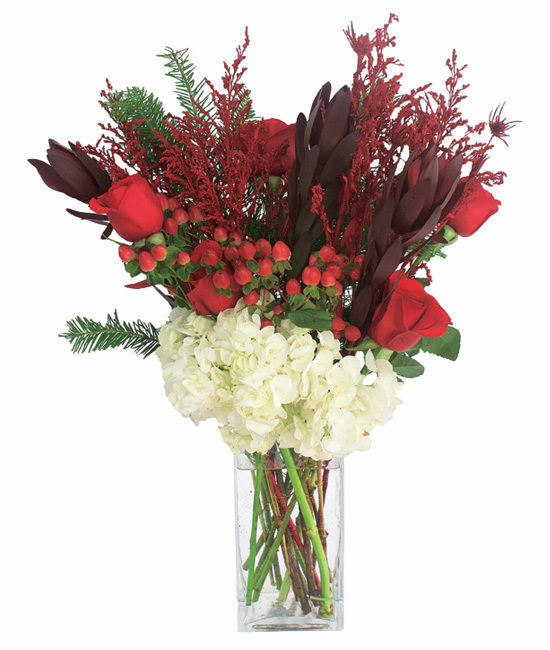 With the colors of the season on display our Christmas Morning Bouquet is a sight to behold. A combination of Red roses and hypericum berries, along with red Painted solidago, pine greens and White hydrangea all tucked inside our classic signature glass vase. Fitting for any occasion. Remove all foliage that will fall below the water line. Cut stems to the appropriate length of your container or vase. Do not be afraid to cut! Some varieties of flowers like hydrangea may look a bit tired upon arrival. Don’t despair! They’re healthy – just thirsty… submerge the blooms completely in cool water for approximately an hour, they will rehydrate and perk up within 24 hours. IMPORTANT! Always add fresh water daily. Change water and recut stems every other day.